8834Gypsum 4w Led White Plaster Wall LightThis LED..
73583The Aerith wall light is finished in a shiny ..
1602-2ABAlberto 2 Light Wall Bracket, Antique Bras..
ALDA-1WBCHA single wall light in a polished chrome..
96971-WBABThe Alonso wall light has an antique bra..
96961-WBCHThe Alonso wall light has a polished chr..
1805-1ANThe Alton is a single wall light with an a..
1805-1SCThe Alton is a single wall light with a sa..
1805-2SCA twin wall light with a satin chrome and ..
9341-1American Diner - 1 Light Wall Bracket, Antiq..
1041-1American Diner - 1 Light Wall Bracket, Satin..
9822-2ABAndretti - 2 Light Wall Bracket, Antique B..
9822-2CCAndretti - 2 Light Wall Bracket, Chrome, W..
5272-2ABAscona Ii - 2 Light Wall Bracket, Antique ..
5272-2CCAscona Ii - 2 Light Wall Bracket, Chrome T..
4262CCLed Bathroom Wall Bracket, Chrome, Clear Bub..
3259ABBelvue 1 Light Bathroom Ip44 Wall Light, Cle..
2030-2ANA twin wall light with scrolled arms in an..
2030-2ASA twin wall light with scrolled arms in an..
1481ABBistro - 1 Light Wall Bracket, Antique Brass..
1481SSBistro - 1 Light Wall Bracket, Satin Silver,..
2671-1ABBistro Ii - 1 Light Wall Bracket, Antique ..
2671-1SSBistro Ii - 1 Light Wall Bracket, Satin Si..
8204ABBox Outdoor Wall & Porch Light - 1 Lightant..
8204SSBox Outdoor Wall & Porch Light - 1 Light Sa..
BOYER-2WBAB-LA twin wall light with curved metal a..
BOYER-2WBCH-LA twin wall light with curved metal a..
BOYER-2WBAB-RA twin wall light with curved metal a..
BOYER-2WBCH-RA twin wall light with curved metal a..
BRIO-1WBABThis wall light has an antique brass fin..
BRIO-1WBCHThis wall light has a polished chrome fi..
4774Brooklyn Led Outdoor Wall Bracket, Stainless S..
CAGNEY-1WBABThe Cagney wall light is finished in a..
CAGNEY-1WBSCThe Cagney wall light is finished in s..
972-2Cameroon 2 Light Antique Brass Wall Bracket C..
0812-2BKCartwheel - 2 Light Wall Bracket, Black S..
9041-1CCCatalina 1 Light Wall Bracket, Chrome, Bla..
70305A stylish exterior, fisherman style lantern c..
70331A stylish exterior, fisherman style lantern c..
60929The Chester wall light is finished in cream w..
CORVINA-1WBThis walnut coloured, wooden wall light..
DOMINA-1WBNIThis Domina single wall light is finis..
DOMINA-2WBNIThis Domina twin wall light is finishe..
7222-2CCElise 2 Light Wall Bracket, C Clear Crysta..
73104A simple vintage style wall light in an antiq..
73524A simple vintage style wall light in an antiq..
FIENNES-1WBNIThe Fiennes wall is finished in chrom..
72983The Finsbury wall light is a modern twist on ..
73584The Finsbury twin wall light is a modern twis..
9273Gypsum Cylinder Flush Ceiling LightThis classi..
9262Gypsum Rectangle Flush Ceiling LightThis class..
3362-2GYGreythorne - 2 Light Wall Bracket, Texture..
212-2Hale 2 Light Georgian Crystal Wall Bracket C..
3302-2CCHanna Chrome 2 Light Round Wall Bracket - ..
2402-2CCHanna Chrome 2 Light Round Wall Bracket Cl..
2402-2GOHanna Gold 2 Light Round Wall Light - Clea..
144-2ANThe Hardwick twin wall light is finished in..
144-2ASThe Hardwick twin wall light is one item wi..
601-1ANThe Haughton single wall light is finished ..
601-2ANThe Haughton twin wall light is finished in..
146-2ABThe Havana is a twin wall light with pull c..
146-2CHThe Havana is a twin wall light with pull c..
61499The Heston wall light has a matt black & rust..
4342-2-LEDIce Cube - Led 2 Light Wall Bracket, Cle..
71346The Indara wall light features a hammered age..
7542-2CCKensington 2 Light Chrome Wall BracketThe ..
LANGELLA-1WBCHThe Langella wall light is finished ..
60842This pendant light has a gloss stone painted ..
60773This wall light has a light grey painted fini..
3761CC-LEDTriton - Led 1 Light Spotlight W/bracket..
5227ABLinea Antique Brass Twist Wall Bracket- Acid..
5227SSLinea Satin Silver Twist Wall Bracket - Acid..
LULLABY-2WBCRA twin wall light with intricate flow..
61708A twin wall light finished in a polished chro..
1072-2NGMalaga - 2 Light Wall Bracket, Antique Bra..
399-2Marie Therese - 2 Light Wall Bracket, Chrome,..
61735The Marlow is a simple but stylish wall light..
61605The Marlow is a simple but stylish wall light..
2007-2WBCHTwin wall light with down-facing opal gl..
6052SSMemphis Led Wall Bracket, Satin Silver, Chai..
60800The Mendip is a indoor wall light finished in..
1131-1ABMilanese - 1 Light Wall Bracket, Antique B..
1131-1SSMilanese - 1 Light Wall Bracket, Satin Sil..
1132-2ABMilanese - 2 Light Wall Bracket, Antique B..
1132-2SSMilanese - 2 Light Wall Bracket, Satin Sil..
850-2CHPolished chrome plate combined with clear g..
3091-1CCMilo Chrome 1 Light Wall Bracket -clear Gl..
MORETO-1WBCHThis wall light has a mirrored stem fi..
NEESON-2WBSNThis 2 light wall fitting comes in a s..
70562The Nixon twin light wall fitting is finished..
60180The Nixon twin light wall fitting is finished..
0572-2CCNova -2 Light Wall Bracket, Chrome, Clear ..
70565Complement and enhance any hallway or recepti..
1062-2CUOlivia 2 Light Ceiling, Black Braided Fabr..
1062-2CCOlivia 2 Light Ceiling, Black Braided Fabr..
70246The Ortona wall light is finished in a matt a..
8732-2ABParis 2 Light Wall Bracket, Clear Crystal ..
8732-2SSParis 2 Light Wall Bracket, Clear Crystal ..
2013-2CHThis twin wall light has glass sphere deta..
124-1WBABA single wall light with frosted glass fl..
124-1The Petal single wall light is one item withi..
124-2WBABA twin wall light with frosted glass flow..
124-2The Petal twin wall light is one item within ..
96751-CHThe Piccolo switched wall light has a poli..
61604The Piccolo is a switched wall light finished..
6085CCPlexus 1 Light Wall Bracket, Mesh Shade, Bla..
6882-2CCPortico Chrome Glass 2 Light Wall Bracket ..
1991-1ABRegency 1 Light Antique Brass Wall Light-t..
2811RURibbon Led Twist Wall Bracket, Rustic Black/..
1502-2ABRichmond - 2 Light Wall Bracket, Antique B..
1502-2SSRichmond - 2 Light Wall Bracket, Satin Sil..
3111CCRings Led Wall Bracket, Chrome, Clear Crysta..
8086-2CCSculptured Ice Ii 2 Light Chrome Curve Wal..
70105Indoor wall light with a secret garden design..
2172-2NGSeville 2 Light Polished Brass Wall Bracke..
2632-2ABSierra - 2 Light Wall Bracket, Antique Br..
Wall lights are ideal for hitting them perfect spots to add emphasis to areas of your wall. 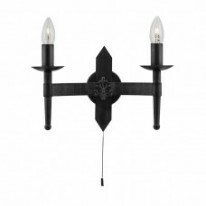 Here at Lumination we supply a HUGE range of wall lights, perfectly suited for everybody’s design and lighting needs. We have chosen to include a large range of colours to match most modern interiors, these include, brass, gold, copper, white, black and more. We have also chosen to include a diverse range of different amount of arms, so you can grab yourself a wall light which can take one bulb to three bulbs. Please feel free to browse our online category, if you need help give us a buzz.